Leopold Bogdan Mandić, Croatian Catholic saint and ecumenist, was born on May 12, 1866 in Herceg Novi as eleventh of twelve children of Petar and Karolina (née Carević) . Being a weakly and sickly infant, he was baptized as Bogdan Ivan a month after his birth. He started showing interest for spirituality in early childhood. Since the Capuchin monastery in Herceg Novi was part of the Venice province, at the age of 16 Bogdan went to the Capuchin seminary in Udine, Italy. After two years spent in Udine, in 1882 he transferred to the monastery Bassano di Grappa so as to enter the noviciate. On April 20 he became a Capuchin under the name Fr. Leopold. He took his vows in May 1885. He started studying theology at the University of Padua and later on in Venice where he succeeded in becoming a priest on September 20, 1890. He could not celebrate his First Mass with his family, so he sent them a photograph. As a celebrant of the First Mass he wished to return to his homeland and work on the unity of the Eastern and Western Church but was reassigned to other duties. 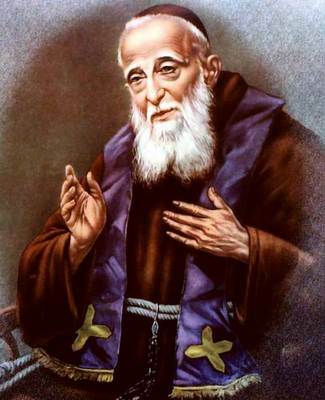 Mandić was travelling to Venice where he taught Croatian language to young Capuchins, a language they would need in pastoral care of the Croatian people. Last forty years of his life were spent in the Capuchin monastery in Padua confessing people for hours. All came to him, the so called ‘ordinary people’ as well as respected citizens: workers, industrials, students and professors, intellectuals, soldiers, officers but also nuns, monks and priests even bishops. He was completely devoted to confession as the confessional was a place of ecumenical activity and where prayer perseveres in its goal for all to be one. Herceg Novi, his birthplace, was divided between the Roman Catholics and Orthodox Catholics. He suffered because of this and made sacrifices so the wound of this division would heal. He loved not only the Croatian people but all Slavic peoples as well as his new homeland Italy and Italians. He built bridges among people and nations and can be considered as a forerunner of united Europe. He celebrated his Jubilarian Mass, i.e. 50 years of priesthood, on September 22, 1940. Soon after that his health rapidly deteriorated. Mandić died on July 30, 1942 as he was getting dressed for celebration of mass, which he never missed. At one moment a deadly weakness overcame him and he died whilst praying Hail, Holy Queen. His grave, which was originally at the city cemetery, soon became a place of worship. His remains were later on relocated to the St. Anthony of Padua church in Padua. In 1946 a process for Mandić’s beatification began. Leopold Bodgan Mandić was beatified by Pope Paul VI on May 2, 1976 and canonized by Pope John Paul II on October 16, 1983. The feast of St. Leopold is celebrated on May 12.